Place this rustic coffee table in front of your sofa or love seat for a convenient and stylish addition to your living room. The multi-colored canyon brown finish brings out the natural weathered look of the Spruce veneers for a beautiful effect. Boasting aged metal casters and a studded metal band around the table top, this piece will blend well with your industrial and modern decor. 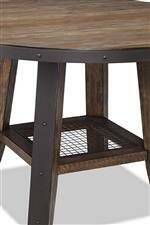 The Taos Rustic Coffee Table with Casters by Intercon at Gallery Furniture in the Oregon, Portland, Clackamas, Washington, Beaverton, Northwest, Vancouver area. Product availability may vary. Contact us for the most current availability on this product. 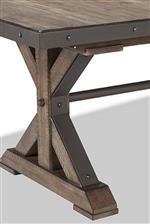 Give your home a rustic yet modern appeal with this casual dining collection. 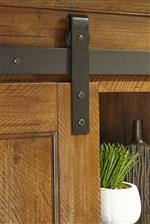 Each piece in this collection is finished in a multi-colored canyon brown and accentuated by industrial metal accents for a unique blend of styles that will fit nicely into classic traditional as well as more modern home decor. 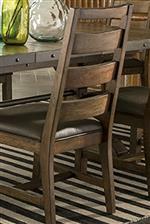 Crafted from Spruce veneers and select hardwoods, this collection offers quality and durability without sacrificing unique style. The Taos collection is a great option if you are looking for Rustic Transitional furniture in the Oregon, Portland, Clackamas, Washington, Beaverton, Northwest, Vancouver area. Browse other items in the Taos collection from Gallery Furniture in the Oregon, Portland, Clackamas, Washington, Beaverton, Northwest, Vancouver area.